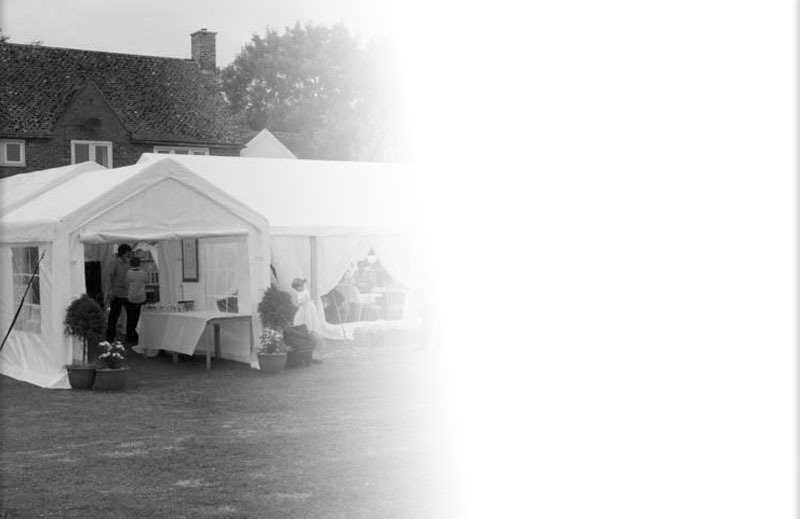 Marquees For All Occasions including Weddings, Parties and many other Private and Corporate Events both in and around the Swindon area but also further afield in Wiltshire, Oxford, Avon and beyond. Our experienced team will arrive at your venue, set up your Marquee and then dress it with a range of options to suit your occasion. Choose from Fully Silk Lined Interiors, a range of Power and Lighting options and a choice of Floor Coverings to suit your particular requirements. 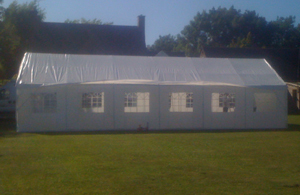 At Crunch Events we have a Marquee Hire package to suit your event. Looking for a Beer Tent?... using our basic Marquees we can create a sheltered area complete with tables and seating (if required) for your guests to enjoy their drinks no matter what the weather - perfect for public shows and other outdoor events. • Choose your Marquee using our sizing guide below. • Silk Linings including Ceiling Drapes and Window Swags. themed colour washes inside and out. • Floor coverings including hard-wearing options and luxury carpets. • Standard 1-2 day hire period (extension rates are available). 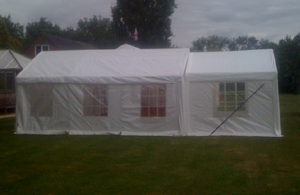 • Set up and take-down of the Marquee at your venue. • Installation and setting up of any options you may have booked. Every client has individual requirements and every proposed venue needs its own special arrangements so please call us or email us for your personalised quotation. 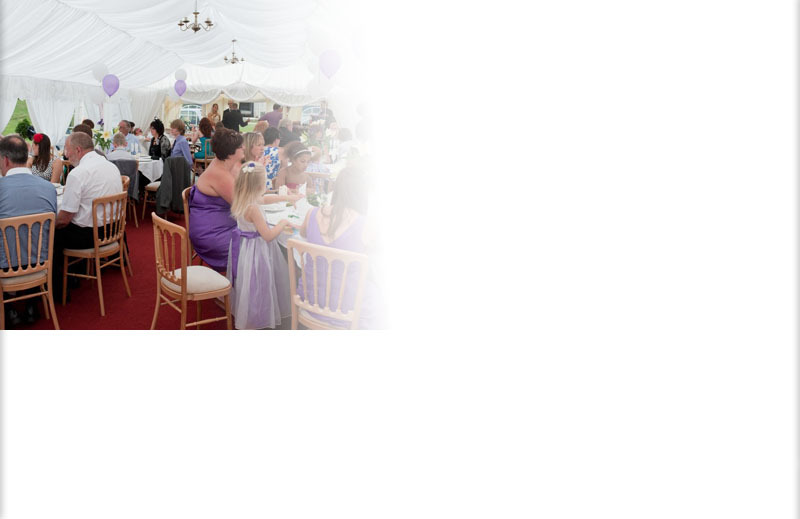 Marquees for those Special occasions | Not just for Weddings | We have packages to suit your special occasion whatever it may be and wherever you're planning to have it. 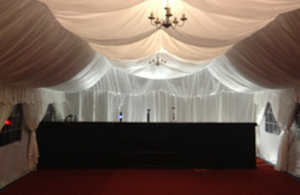 Allow us to provide a fully 'dressed' marquee for your special occasion with silk lined ceiling, walls and windows swags. Luxury carpet flooring can be installed along with one of our Licensed Bars to give your event that wow factor! Modular Marquees | All of our Marquees are 'Clearspan' modular units meaning they can be used together to create the perfect flexible space for your event. To help you decide on what size Marquee you might need for your event - Here's a very simple sizing guide. These form the main building blocks of our marquee packages. By using one or more of these units, we can create as large a space as you might need for your particular event. 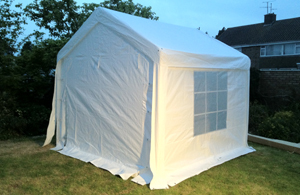 We can then add side rooms, extensions and entrance ways using our smaller marquee units breifly outlined below. Great as a small marquee outright but equally at home as part of a Multi-Marquee package forming extensions to the main space or as a side room for chillout area, catering operations such as kitchens or bar areas. Can be used on its own or mated to other units of the same or different size by removing sides to build a flexible space that suits your requirements. NEW 8m long units now offer even MORE flexibility! Great as a small events shelter but equally at home as part of a Multi-Marquee package forming space for an entrance way or side room. Sizing Up your event | How we size our marquees. 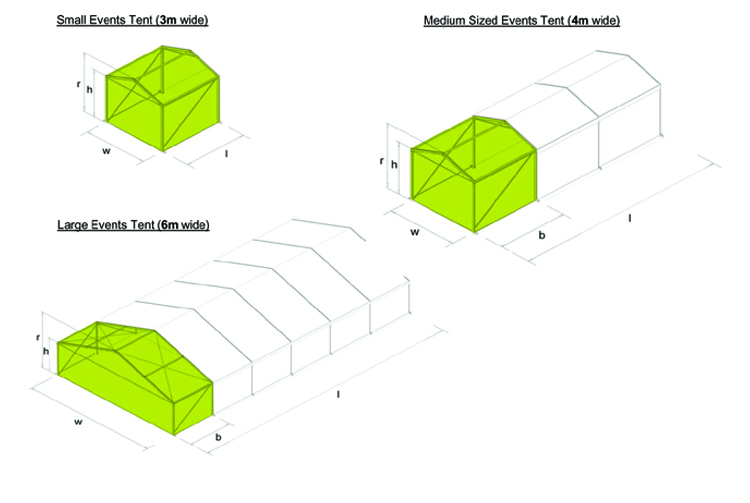 Should you need to measure how much space our Marquees occupy - here's how we size our units. into your proposed space and that there are no other issue we may encounter when we arrive to set-up. A Complete Package Solution | Ask about other services that we can arrange such as Furniture Hire, Crockery & Tableware Hire, Table Dressing and even Balloons. If you have any questions or queries relating to Marquee Hire for your event then just give us a call on (01793) 496929 to discuss your requirements.